Snapchat parent Snap Inc. has finally revealed its long-awaited IPO filing. The social messaging company, which plans to go public in early March, just shared details about its growth trajectory and financials. And while we knew that Snap has raised at least $2.4 billion in capital from a long list of investors, we now know the ownership percentages. We also know the pre-IPO values of the shares. 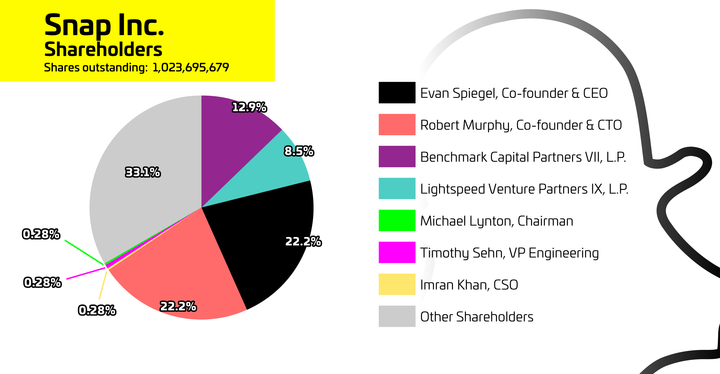 Based on the information from the filing, we see that co-founders Evan Spiegel and Bobby Murphy, each own roughly 22.2% of the company prior to its IPO, though this number will change once Snap goes public. For comparison, Mark Zuckerberg owned 28.2% of Facebook at the time of its IPO filing. If you calculate their total shares times the share price of the last private round ($15.36, due to a stock split), this means each founder owns about $3.5 billion of the company, Hari Raghavan from Equidate points out. Using the same method, we see that Benchmark and Lightspeed Venture Partners own about $2 billion and $1.3 billion, respectively. Snap previously authorized a new class of shares that would help founders Evan Spiegel and Bobby Murphy retain control of the company. According to the filing, each co-founder presently holds 44.3% of voting rights. Benchmark holds just 2.7% and Lightspeed has 1.8%.